// Create an Array of Tasseled Cap coefficients. // Get the 1x6 greenness slice, display it. Observe that the start and end parameters of slice() correspond to the 0-axis indices displayed in the table (start is inclusive and end is exclusive). 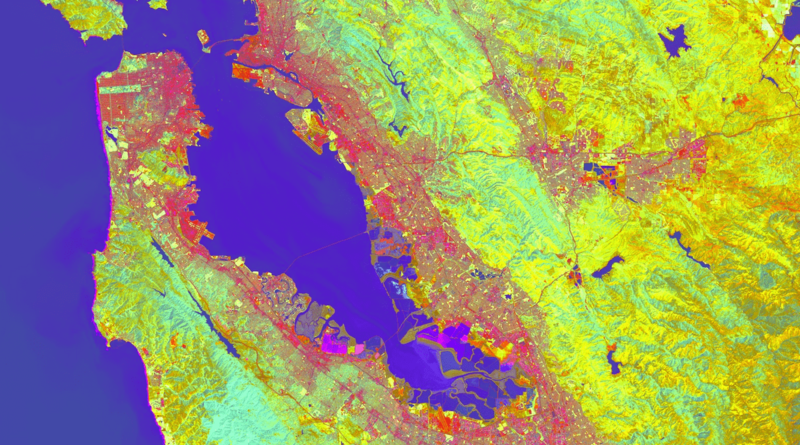 // Load a Landsat 5 image, select the bands of interest. // Make an Array Image, with a 1-D Array per pixel. // Make an Array Image with a 2-D Array per pixel, 6x1. // Do a matrix multiplication: 1x6 times 6x1. // Cast the greenness Array to an Image prior to multiplication. // Get the result from the 1x1 array in each pixel of the 2-D array image. // Display the input imagery with the greenness result. // Define an Array of Tasseled Cap coefficients. // Do a matrix multiplication: 6x6 times 6x1. // Display the first three bands of the result and the input imagery. Figure 1. Tasseled cap components “brightness” (red), “greenness” (green), and “wetness” (blue).